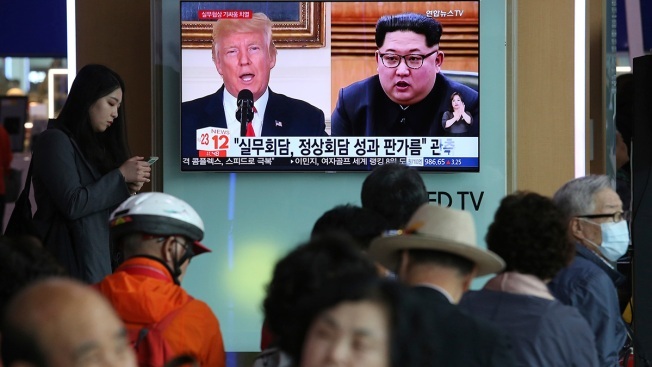 People watch a TV screen showing images of U.S. President Donald Trump, left, and North Korean leader Kim Jong Un during a news program at the Seoul Railway Station in Seoul, South Korea, Tuesday, May 29, 2018. Less than a third of United States voters believe the U.S. summit with North Korea will have a positive outcome, according to a NBC News/Wall Street Journal poll. A combined 36 percent of voters say President Trump will either be too demanding (26 percent) or give up too much (10 percent) in the negotiations. Thirty-one percent of voters are more optimistic, either saying the agreement will be fair to both sides (17 percent) or better for the United States (14 percent). Another 31 percent say they don’t know enough to give an opinion. Republicans are more confident in the outcome of the summit than Democrats. Six-in-ten GOP voters say that there will be a balanced deal (30 percent) or a deal that favors the U.S. (29 percent). That’s compared with only 8 percent of Democratic voters who expect a positive result. The overall margin of error in the poll of 900 registered voters from June 1 to 4 is plus-minus 3.3 percentage points.